My island travels for Australia’s Islands, my book to be published by the National Library of Australia in October 2019 took me to a number of wonderful islands off the Western Australia coast in late 2018. I drove up to Dirk Hartog Island, took a lightplane out to the Houtman Abrolhos Islands (site of the wreck of the Batavia), made a long boat trip out to Middle Island with its bright pink lake and finally spent a long weekend on Rottnest Island, a short catamaran ferry trip from Fremantle. In January 2019 I headed south from Melbourne to Erith Island in Bass Strait. 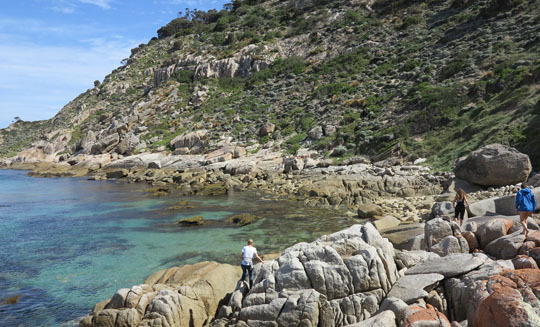 It’s part of the Kent Group, half way between Flinders Island (just north of Tasmania) and Wilsons Prom (the most southerly point on mainland Australia). 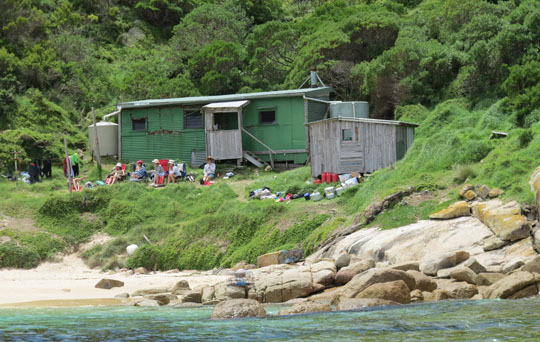 ▲ Some of the ‘Erith Mob’ and the West Cove cabin. I was joining the ‘Erith Mob’ who come down to island from the mainland every January-February. They’re the official island caretakers at that time, but the rest of the year the cabin is there for anybody to use including stranded castaways from the occasional Erith Island shipwreck, or yachtwreck on this occasion. The cabin’s only big enough for two, the rest of us camped in tents. 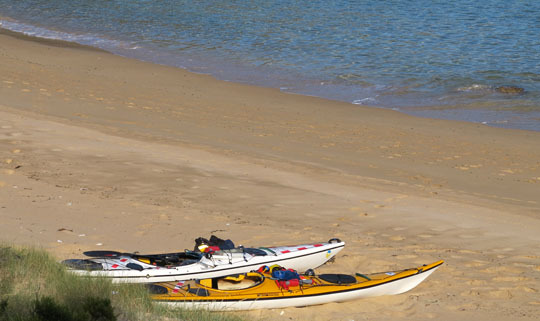 ▲ The island also sees kayakers who paddle across, island hopping from Wilsons Prom to Flinders Island. The trip typically takes a couple of weeks, waiting on islands for a good weather window for the next long open sea crossing. It’s about 150km across so this is not a trip for beginners. ▲ There were 13 of the Erith Mob on the island, they’d come down by boat a week earlier, before I arrived on the island with another visitor by helicopter. Josiah flew us down, Lisa flew us back, a fair distance over water for a helicopter. 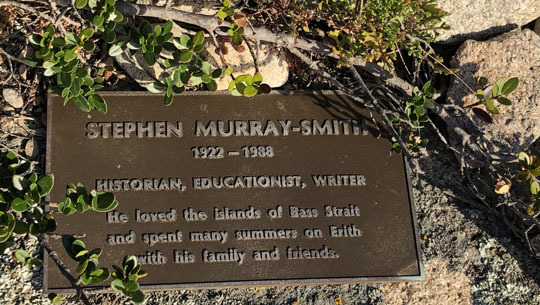 ▲ Stephen Murray-Smith, Australian icon and founder of the literary magazine Overland, was the mob founder and his ashes and those of his wife Nita are buried on the island. His daughter, playwright Joanna Murray-Smith, was on the island when I was there and had a play, Songs for Nobodies, opening at a London West End theatre. 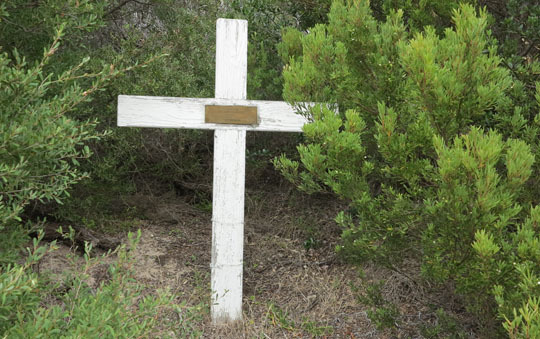 ▲ He’s not the only island burial, there’s a lonely cross marking the grave of George Phillpotts: seaman, HMS Myrmidon, died 26 December, 1886, aged 18 years. ▲ Fortunately there are no dangerous snakes on the island – Tiger snakes are not a nice thought when you’re marching through the undergrowth in shorts and Tevas. 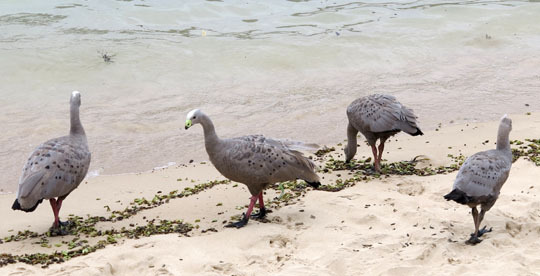 There was lots of bird life including this friendly family of Cape Barren geese, the parents working on teaching their large-sized offspring how to fly. 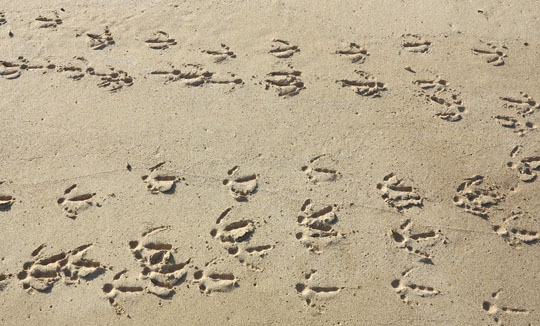 ▲ Meanwhile they left tracks up and down the beach. ▲ Flying back to Melbourne I was looking for two other Bass Strait island. Boundary Islet is 30km north-west of Erith Island in the Hogan Group. A colonial era charting error ran the border line between the colonies of New South Wales and Van Diemen’s Land smack through the middle of the island. 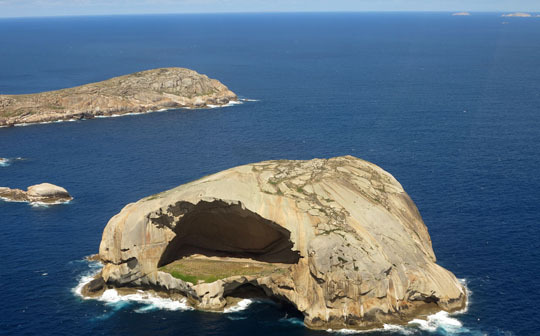 As a result the states of Victoria and Tasmania – they certainly weren’t around in 1801 when Boundary Islet was misplaced – have an 85-metre land border right across the island. 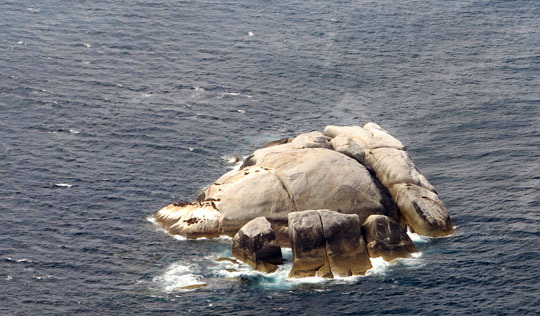 ▲ Closer to Melbourne, just south-west of Wilsons Prom, we flew past Cleft Island, better known as Skull Rock. You could slip the Sydney Opera House into that cave.